Guardian columnist takes swipe at Israel in story focusing on noise at Heathrow. What does the British debate over plans to build a third runway at London’s Heathrow Airport have to do with Israel? 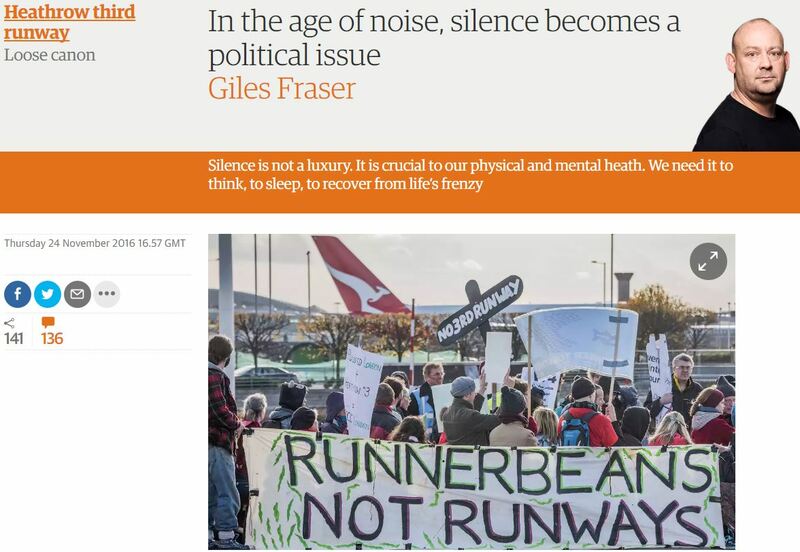 Fraser is clearly sympathetic to the residents of Richmond Park protesting against a planned third runway at Heathrow airport and indeed devotes much of his column reflecting on what he refers to as the ‘forgotten pollutant of noise’ in society. “Silence”, Fraser opines, “is crucial to our physical and mental health”. Yet, seven paragraphs down, Fraser finds an effort to limit noise pollution he doesn’t seem to fancy. And one cannot celebrate silence uncritically. Being silenced is what happens to those who are victims of abuse. Moreover, what counts as bad noise is often controversial. The Israeli Knesset is currently passing legislation to silence the Muslim call to prayer, legislation that has been recently redesigned not to effect the Jewish Shabbat siren. The Guardian columnist fails to explain that the latest version of the bill reportedly would also limit its scope to the first of the five daily Muslim calls to prayer – the one just before dawn. The broader context omitted in the column relates to the fact that (according to Knesset commissioned research) “in several European states (including the UK) the call to prayer through PA systems is either banned altogether or subject to limitations on days of the week, hours and level of decibels”. Such limits exist, in some form, in Muslim countries as well. Our colleague Tamar Sternthal recently highlighted attempts in Egypt to “restrict the call to prayer to only the largest mosques in order to reduce noise”. Cairo, as well as some Saudi cities, she adds, “currently impose decibel restrictions on the muezzin’s call”. Our point isn’t to debate the merits of the Knesset’s muezzin bill, but to question why Fraser highlighted only Israeli efforts to limit noise from mosque loudspeakers – in a column focused on noise from a British airport – when he could have used similar examples from anywhere in the world. Of course, those who’ve followed our posts on Fraser – who’s smeared Israel with the charge of apartheid, came close to justifying Palestinian terrorism and once even compared Israel to an autistic child – would likely see this latest gratuitous swipe as merely another example of his malign obsession with the Jewish state. Giles Fraser,whom I always confuse with Comedian Johnny Vegas, is being extremely crafty here. There is no doubt that the Muslim call to prayer will be demanded by ALL Mosques in Britain soon. By exposing the Israeli refusal our Guardian ‘rulers’ ensure that no fawning British Guardian reader would EVER want to be accused of agreeing with Israel. SO, expect the Guardian to support the call to prayer in England quoting Israel as the nasty refusenik. Giles Fraser is guilty of print pollution. He does however prove through his presence that stupidity and prejudice walk hand in hand. Imagine how outraged he would be to find out that the muslim right to arson has been outlawed in Israel. The point is synagogues are unsurprisingly exempt from this bill and the Palestinians are the native population, not immigrants. The Muezzin bill is about more than noise. Could you tell us uninformed readers when can we hear the call for prayer from a synagogue? Just asking…. Do you even know what the muezzin bill calls for? It doesn’t call for banning the muezzin. It only calls for preventing the use of loudspeakers before dawn. If you find that in any way unreasonable, then why are you not complaining to the many European cities that have already instituted such bans? I think if you really search your own motivations, you would not be happy. Point 1: synagogues don’t have someone yelling from a tower or publicly over a loudspeaker. Point 2: The land had been inhabited before 1967. Point 3: Arabs immigrated from Arabia, hence the name. Jews are from Judea, hence the name. Your ignorance deprives you of knowledge. Perhaps you missed the part about it being confined to pre dawn calls. Try re-reading and then get back to us. NS1, Your “palestinians” are the native population of Syria, Jordan, Iraq, Egypt, Lebanon, Turkey and Atlantis. Synagogues don’t noise pollute, so precisely which function would you have legislated about? What difference does it make who is ‘native’ or ‘immigrant’? You’re surely not racist, are you? Don’t I know it! Those Zionists are a conniving lot, somehow placing the ruins of their 3500 year old Temple underneath that glorious tower to Allah known as Islam’s Third Holiest Site (of all time111111)! Thank you, NS1, for being so KKKlear and KKKoncise with your KKKriticism! The Muezzin bill is about nothing but noise, and so are you.